How To Buy The Best Mirrorless Camera - Which? 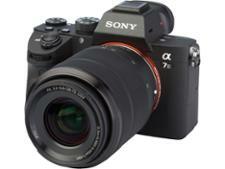 Mirrorless cameras, or compact system cameras (CSCs), are lightweight affordable alternatives to DSLRs. We help you pick a first-class model. Whether you’re looking for a step up from a compact camera, or a lightweight portable backup to your DSLR, there are plenty of great CSCs available. The best models give you picture quality similar to a good DSLR and a higher level of control than you’d find in smaller cameras, but in a light and compact form. So what are compact system cameras? They have a similar look and feel to a DSLR but as they don't have an optical viewfinder like a DSLR they don't need to have a reflex mirror inside to bounce light up into it. In a mirrorless camera (the alternative name for a compact system camera), light goes directly onto the image sensor, and a digital preview of the image appears in an electronic viewfinder or LCD display. This means that what you see is closer to how the final image will look. They’re usually smaller, lighter and faster than DSLRs and better for video, but without the extensive library of lenses and accessories that DSLRs offer. Compact system/mirrorless camera reviews - discover the best mirrorless camera for you, whatever your budget. What type of mirrorless camera should you buy? Most mirrorless cameras fall into three distinct categories: entry-level, enthusiast and professional. This doesn’t mean that the pro-level camera will guarantee professional-quality shots, it just means that the features and settings are those that professional users need and want. Entry-level models are an excellent starting point for anyone looking to upgrade their photographic skills above a point-and-shoot camera. They offer more creativity and control, thanks to the interchangeable lenses, but typically offer an LCD display instead of a viewfinder to compose your shots. They also have a smaller sensor (which sacrifices some image quality). With another level of control and image quality over entry-level models, enthusiast mirrorless cameras are the most comfortable transition for DSLR users. Many of these include an electronic viewfinder and LCD display, so you can preview your photos regardless of reflections or glare from bright light. If you’re looking for the best image and video quality possible, a professional-level mirrorless camera is what you need. Available with different sensor sizes and more durable camera bodies, which are sometimes weather-sealed, they also include very fast image processors. The processor speed directly correlates to autofocus performance and buffering when taking continuous shots (also known as burst mode). Advanced enthusiasts or professional camera users will instantly feel at home here. How much should you spend on a mirrorless camera? The mirrorless camera market has matured considerably over the years, with improvements to autofocus, shutter speed and video recording quality, which means that some models have overtaken their DSLR counterparts. So what does this mean for you? There are more options to choose from at a wider range of prices. Whether you’re looking for a camera to capture fast action or one that is compact enough for travel, you’ll find a mirrorless camera to suit. After you choose your preferred sensor size or brand, it’s worth considering what kind of lenses you might already own, or what types of lenses exist for the various cameras you are considering. Some manufacturers have a wider range of lenses for their mirrorless models than others, and this might be important to you if you like different lens options. Like DSLRs, mirrorless cameras can be purchased body-only (meaning it doesn’t include any lenses) to pair up with any lens you desire or as part of a bundle with a simple lens kit to get you up and running. Entry-level cameras can start from £300, while other high-end models are available for around £3,000. We've found Best Buy mirrorless cameras ranging from around £300 to more than £3,000. While the upper end of this price range might seem expensive, compared with high-end DSLRs that are priced at £5,000 or more, the ‘expensive’ mirrorless cameras are good value for what you get. Slimline vs chunky design DSLRs contain a mirror and a prism (similar to how a periscope works) to view a more accurate image, but, as the name suggests, mirrorless cameras don't. Some photography purists argue that the mirror in a DSLR makes for more detailed photos, but our expert testing doesn’t agree. Both types of camera have received numerous Best Buy awards. Since mirrorless models don’t use a mirror to take photos, they’re a lot slimmer and more portable than DSLRs. Bigger sensor, better photos Generally speaking, cameras with a bigger sensor take better photos. This is because they can capture more scenery and greater detail in low light. If picture quality is paramount to you, you will want to shop for a DSLR with an APS-C or an even larger full-frame-sized sensor. Mirrorless cameras predominantly rely on APS-C sensors or a smaller micro-four-thirds sensor, however, there are full-frame models available now as well. Mirrorless camera are cheaper Although features such as wi-fi, tilting displays and 4K video recording are just being introduced to DSLRs, they’ve been available for some time now on mirrorless cameras. These cameras start at £200 and tend to offer more features for less money, whereas DSLRs are available from £300 and concentrate on offering a more premium experience. An electronic viewfinder means increased accuracy If a mirrorless camera does have a viewfinder, typically it will be an electronic viewfinder (EVF) instead of an optical one (OVF). An EVF is essentially a tiny LCD screen. You use it just like an OVF, and what you see is what you get - it shows exactly what the lens sees, provides 100% coverage and there’s no guesswork as to how an image will turn out before you’ve taken a photo. One noticeable downside is that it can mean a lag between the scene in front of you and that shown in your viewfinder. As well as not suffering from this lag, optical viewfinders in a DSLR show around 96-97% of the entire photo you’ll capture, instead of the 100% preview you’ll get with a mirrorless camera. 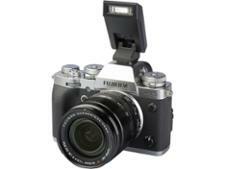 What makes a good mirrorless camera? Sensor size Thanks to their larger sensors, which are better at harvesting the available light and transforming it into a clear, crisp photo, mirrorless cameras produce better pictures than compact or bridge cameras. Some use the one-inch sensor size used by a handful of advanced compact cameras, but most use a micro-four-thirds sensor or the APS-C sensor size used in many DSLRs. What’s more, a few high-end mirrorless cameras are now using full-frame sensors - the same size as high-end DSLRs. These can produce incredibly rich and detailed shots. Lens compatibility When you buy a mirrorless camera, you’re buying into a system, so make sure that the one you choose has the lenses to satisfy your photographic needs in years to come. Many entry-level models come with budget or kit lenses that might not show off the camera at its best, so ask yourself if it is a false economy or whether it would be better to get a mid-range camera with a better lens. 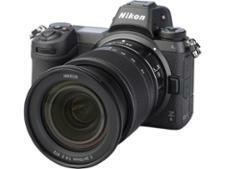 Fast shutter speed Mirrorless cameras often have faster maximum shutter speeds than DSLRs at equivalent prices. That’s great news for sports and wildlife photographers, who need to capture fast-moving subjects. Autofocus One downside is that some mirrorless models, lacking the advanced autofocus systems of DSLRs, struggle to sharply focus in high-contrast and low-light situations. However, the good news is that many newer models now offer a hybrid focusing system. For fast autofocus, especially in low light, consider a camera with a hybrid autofocus system. Electronic viewfinder Essentially a tiny LCD screen, an electronic viewfinder shows exactly what the lens sees, with 100% coverage. It also overlays additional information, such a shutter speed or Iso level, so you can identify settings at a glance without taking your eye away from the viewfinder. Video recording DSLR cameras set the stage for high-quality video, recording in Full HD, but most mirrorless cameras now offer 4K video recording, which is four times the resolution of Full HD. Apart from the difference in video resolution, the smaller size of the system camera allows for longer shooting, with less fatigue than shooting with a DSLR handheld. If you’re looking to record video seriously, look for models that feature connections for an external microphone, headphones or a video monitor. Wireless connectivity Some cameras allow you to wirelessly transfer images from your camera directly to your phone or tablet, or favourite social media site. You can even pair up your camera with a companion app, for either Android or iOS, to remotely control the camera and easily snap a family portrait.